Now that we’ve finished our dated 1970’s bathroom remodel, I wanted to know the total bathroom remodel costs. In this post, I’ll detail all the costs and give some tips on how to save money on a bathroom makeover. According to HomeAdvisor.com, the average cost of a bathroom remodel is $9,741, and the average range is $8-10K. Our original plan for the bathroom was going to land right in that range – about $10K. But, after sacking the contractor, we had to pivot and make some big changes. Doing most of the work ourselves, we came in way under that! While it’s not a “dream” bathroom, and certainly won’t be featured in a magazine, we’re very happy with it. It’s just right for this house and this neighborhood. I’m happy to say that we completed the project for $2,300. That’s $7,700 I can spend somewhere else in the house. Right, Dear? It’s a 5’x10′ hall bathroom, straight outta 1977. Everything – tub/shower, toilet, flooring, counter, and sink – were all Harvest Gold. You can see the bathroom in all it’s glory in My 1970’s Bathroom Remodel – Before post. 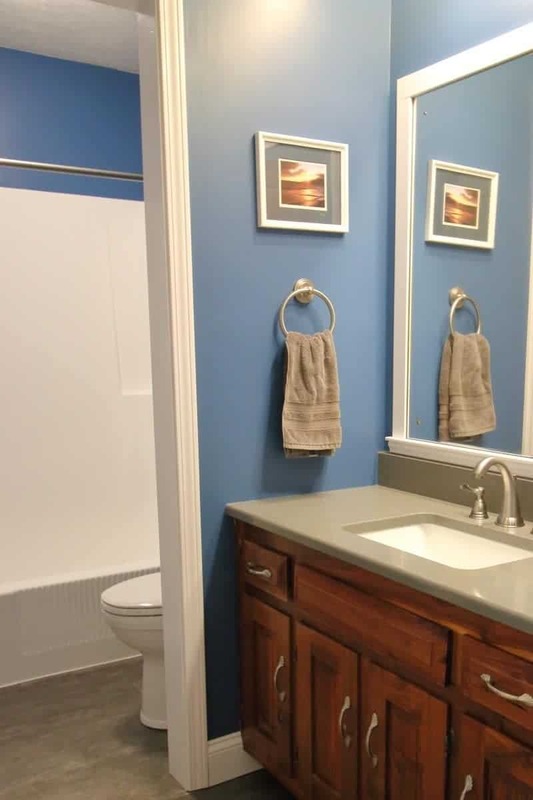 For most people, the number one question is, “How much does a bathroom remodel cost?” Because, if you can’t afford the project, it’s all just Pinterest boards and dreams. Not that that’s a bad thing! We saved money by keeping all the plumbing fixtures where they were, and not completely gutting the bathroom. The original tub/shower unit, vanity cabinet, mirror and medicine cabinet were in good condition, so they stayed. But, the Harvest Gold color of the tub needed to go, so I refinished it. By refinishing the tub/shower unit, rather than replacing it with a cast iron tub and ceramic tile surround, we saved almost $1,000 just in materials. Additionally, we saved money by doing a combination of DIY and hiring professionals. We did all the work ourselves except for installing the toilet and the flooring. The bathroom remodel took longer, but we saved more money that way. While we tried to save money where we could, we did splurge on the vanity countertop. 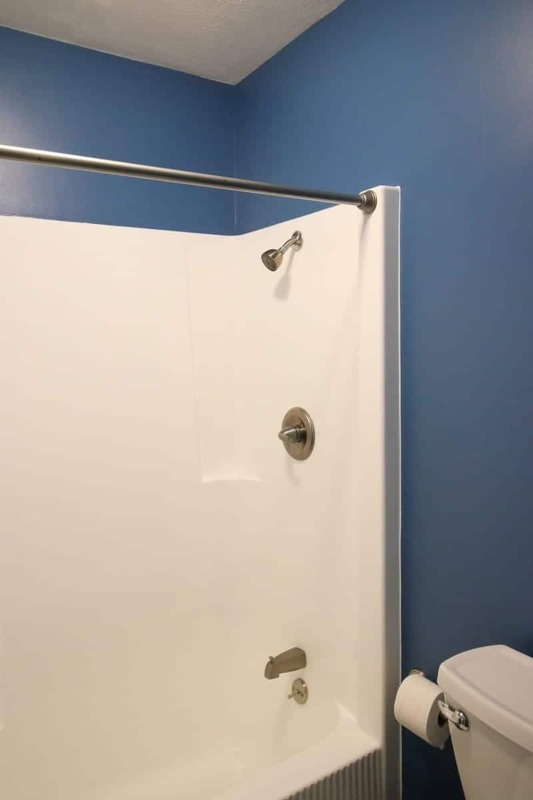 It is one of the most noticeable things in this small bathroom; the tub is basically hidden behind the curtain, and one toilet is pretty much the same as the next. But the vanity is prime real estate and we wanted it to be nice, so we went with quartz. This beautiful Uliano quartz countertop by Vicostone coordinates with the new counters we installed in the nearby kitchen. Now, for the money saving tips! Start with a clear plan and budget. And then add 10% for unexpected costs. When we replaced the toilet, we had the plumber replace the shut-off valve since the old one was broken and corroded. It wasn’t an expensive add, but it wasn’t in our original budget. Rather than completely gutting the bathroom, consider keeping as much as possible. We used this bathroom remodel checklist to decide what to keep, what to repair, and what needed to be replaced. Obviously, if something is broken beyond repair, then it needs to be replaced. But, if it works just fine and is out of style, can you update it or just live with it being out of style? Or, is it worth the money to replace? DIY as much as you can. We chose to have the toilet installed by a plumber because we didn’t want to deal with the “aftermath” if we did it wrong. The sink’s plumbing was straightforward, so we did that ourselves. 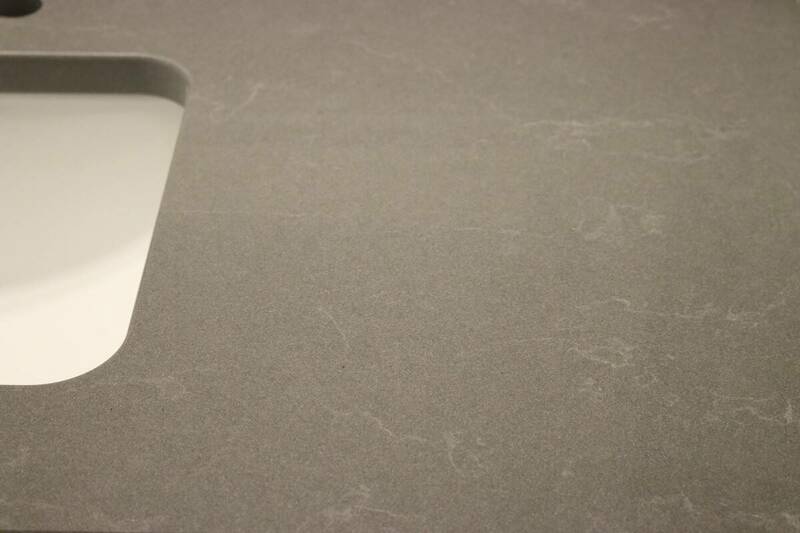 Consider economical alternatives, such as sheet vinyl flooring rather than ceramic tile. Cultured marble, solid surface, or Corian are good choices for the countertop if quartz or granite are out of your budget. Pinterest is great for finding DIY or budget ideas for your bathroom makeover. This one’s pretty obvious, but I’m going to include it. Tackle a bathroom remodel like you would any other major purchase: comparison shop, buy the best you can afford, look for economical options, and buy materials when they are on sale. You don’t have to buy all the materials at once (or even do all the work in one go), or all at one store. I did a lot of shopping at Lowe’s, Home Depot, and Menard’s. Keep Amazon in mind, when comparison shopping. Sometimes their prices and free shipping are cheaper than what you can buy at the big box store. Did you know you can buy this American Standard toilet on Amazon, and get free shipping? The UPS man won’t be too happy with you, but it’s definitely an option. Be sure to pin this! Although I think this project was money well spent, it’s surprising how quickly it adds up. 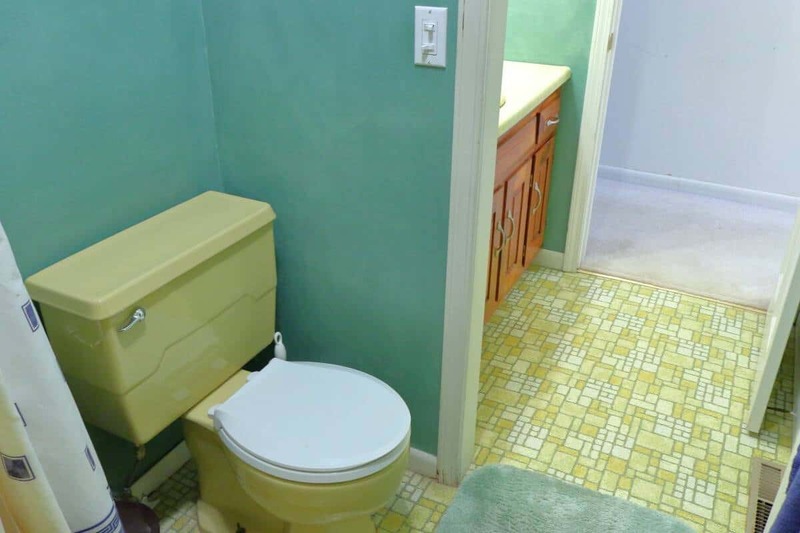 In the end, I’m very happy with our bathroom remodel, and I am no longer embarrassed by our 1970’s yellow bathroom!